When X-rays pass through tissue, such as a woman’s breast, the primary rays travel straight through, whereas some of the rays are scattered. This scattering phenomenon is known as the Compton effect – discovered by Arthur Compton in 1923 – in which an X-ray photon interacts with a charged particle, usually an electron, losing energy and moving in a different direction with an increased wavelength. 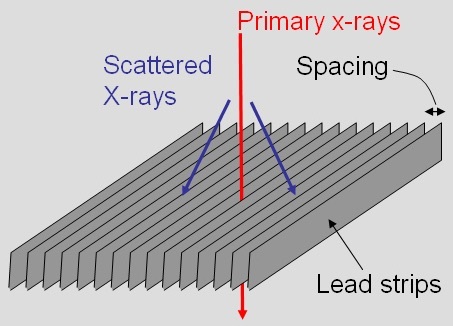 Since the scattered X-rays strike the X-ray sensor and introduce unwanted noise, various anti-scatter techniques have been introduced. One of these is a grid made up of parallel lead strips (seen above right, © SUNY). A major drawback when employing an anti-scatter grid is that the radiation dose must be increased which of course is not ideal in this era of the ALARA (as low as reasonably achievable) principle. To solve this problem, engineers at Siemens have developed software algorithms to remove the noise in digital mammography images acquired without an anti-scatter grid. Scientists from Denmark, led by medical physicist Ahmed Jibril Abdi, working with Siemens Healthineers, have just published a paper in the European Journal of Radiology in which they compared screening performance and patient dose for two acquisition modes: with and without a lead grid. The Danish National Breast Screening Programme offers women between the ages of 50 and 69 a free screening mammogram every two years. In November 2013, the Siemens Mammomat Inspiration system was upgraded so that images could be acquired without the anti-scatter grid and software scatter correction was implemented. This was a retro-spective study, which included 50,071 women screened before the upgrade and 22,117 after it had been introduced. 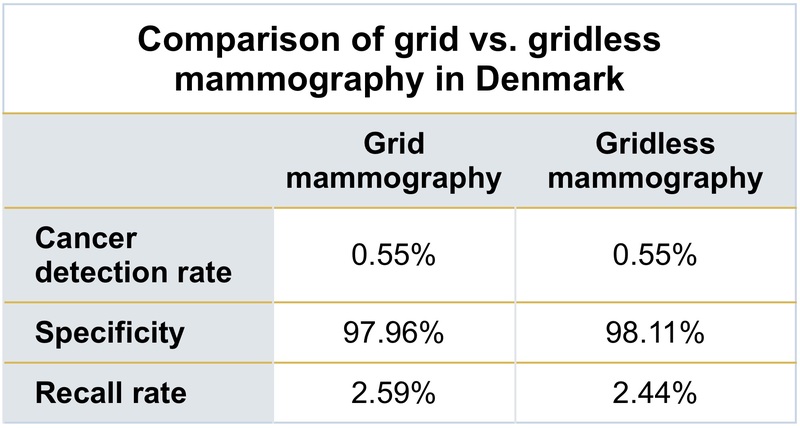 As seen in the table above left (© AuntMinnie.com), there was essentially no difference in the performance when grid vs grid-less mammography was compared. In addition to the patient study, the authors also conducted a series of phantom studies in order to compare patient dose values between the two acquisition modes. In the figure below right (© European Journal of Radiology), the average glandular dose is plotted as a function of breast thickness. 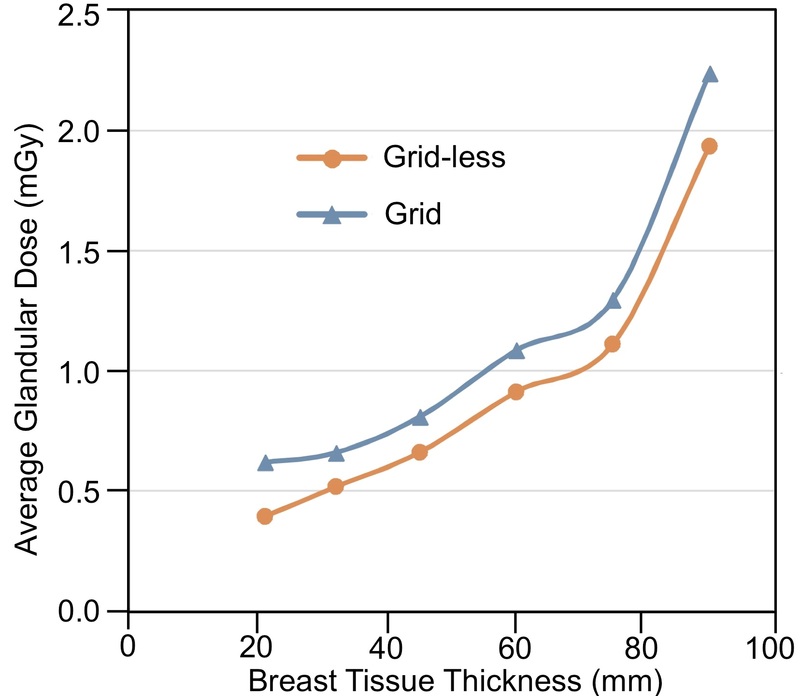 As can be seen, the patient dose savings for grid-less acquisition are substantial: between 13.5% and 36.4%, with greater benefit for thinner breasts. CapeRay’s Aceso system, which combines full-field digital mammography and automated breast ultrasound in a single platform, does not have a grid. Instead it employs a slot-scanning geometry that eliminates scatter, enabling high quality images to be acquired at a low dose. Well done CapeRay, your grid system sounds so “elementary dear Watson” that details will not summarily be disclosed to envious competitors and nosey readers.